Summer can pose an increase in on-road dangers for motorcyclists in Maine; the largest percentage of the nearly 3,000 motorcycle crashes in the state between 2006 and 2010 occurred from June to August. Most collisions occurred on Saturday and Sunday during the late afternoon and evening hours, according to the Maine Department of Transportation. Causes of the crashes varied widely, with about two-thirds attributed to human factors like disregard of traffic laws and improper driving. If you have been hurt in a crash, the Maine motorcycle accident lawyers at Hardy, Wolf & Downing invite you to contact them to discuss your legal options. The law is on the side of victims, and you may be entitled to monetary compensation for your injuries and losses. In recent weeks, motorcycle drivers have been injured and killed on Maine roadways. The Portland Press Herald reports that a man from Kittery was killed in a motorcycle accident in New Hampshire. The motorcycle belonged to a friend and the man driving was not wearing a helmet at the time of the crash. Cause of death was “substantial head injuries.” Witnesses at the scene performed CPR, but the victim was pronounced dead at Portsmouth Regional Hospital after he was transported there. Another man was killed in Bethel in an accident involving a car and a motorcycle. According to WCSH 6, the motorcycle collided with the car as the vehicle was turning onto Sunday River Road from Rte. 2. The driver of the motorcycle was pronounced dead at the scene and a passenger was taken to a local hospital and then airlifted to Central Maine Medical Center, where her condition was unknown. The driver and passenger in the car were taken to an area hospital with non-life threatening injuries. Two injury accidents were also reported in Maine recently. The first occurred on Calais Road, when a motorcycle attempted to pass two cars. The driver of the motorcycle did not realize the car in front was taking a left turn and his bike collided with the front driver section of the vehicle. The motorcycle driver’s ankle was wedged between the car and the bike during the collision. He was taken to Houlton Regional Hospital with non-life threatening injuries to his leg. Another motorcycle driver was injured when his bike collided with a young deer in Ripley. The deer ran out in front of the motorcycle, and the driver was unable to see the deer at first because of sun glare. Although the driver’s helmet was split in half, physicians at Eastern Maine Medical Center where he was taken said his injuries were serious, but not life threatening. 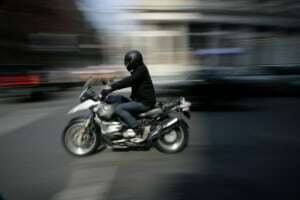 Motorcycle accidents can be life-changing for the driver and passengers of the bike. In Maine, three percent of all motorcycle accidents between 2006 and 2010 involved fatalities. Nearly 600 accidents involved incapacitating injuries. That translates to significant medical bills and possible lost wages as the victims of these accidents are often unable to return to their vocation for a long period of time. For some, a Portland, ME motorcycle accident lawsuit allows them to pursue compensation for their injuries and financial losses. For those who were not responsible for the accident, legal action may be the only way to hold the responsible party accountable for their actions. If litigation is the right choice, it is important to have experienced Maine motorcycle accidents lawyers on your side to protect your rights and argue your case in court. The legal team at Hardy, Wolf & Downing has ample experience working with victims of motorcycle accidents. We understand the complexities of motorcycle law in Maine and will work hard to ensure accident victims receive the full compensation they are entitled to. For more information, or to receive a free evaluation of your case, contact the Maine car accident attorneys at Hardy, Wolf & Downing at 1-800-INJURERD.